…because we don’t have a car. Actually, neither of us can drive. But we’re still calling it a Road Trip! Running a film society can be an insular endeavour. Usually you spend all your time balancing the tasks and responsibilities of the society with a nine-to-five and a social life, which leaves little time for you to take a step back and observe all the great things that other societies and community cinemas are accomplishing. A highlight of my two years with Minicine has been the annual British Federation of Film Societies National Conference; a weekend of informative and inspiring panel talks and screenings of some of the most must-see independent and foreign language cinema. The best aspect of the conference, for me, is getting the chance to talk with the committee members and organisers of film societies/film clubs/community cinemas – however they may classify themselves – and hearing about all the great films they have screened and the inspiring events they have hosted over the previous twelve months. It’s reassuring to hear that on occasion many have faced similar issues and set-backs as we have, but more importantly it’s a motivating experience; I’ve never felt more excited and invigorated to be working as part of the film society and community cinema movement than when I’m on the train home from London. I can pretty much guarantee that during each of those conversations I’ve said something along the lines of ‘we’ll have to come one of your screenings sometime’, yet despite having the best intentions, time has never been on our side. This year, thanks to the additions of Abi and Holly to the Minicine team, we’ve got our stuffs together, we’ve got (most of) our programme locked for the year, and we’ve finally got some spare time on our hands. So we’re hitting the road and checking out what everyone else is doing. We started last night with a trip to HEART Community Centre in Headingley, Leeds for a screening Caesar Must Die (2011) and will be attending many more throughout West Yorkshire over the next couple of months. From there, Britain is our oyster. Don’t worry, we won’t forget to send a postcard. In fact we’ll be posting a summary of each destination we visit (we’ll have one for last night’s screening up on the website later today) as the reason we’re going to each event in the first place is that we feel they deserve to be talked about, so we’ll be more than happy to share our experiences with you all. Here’s to independent and community film presentation. 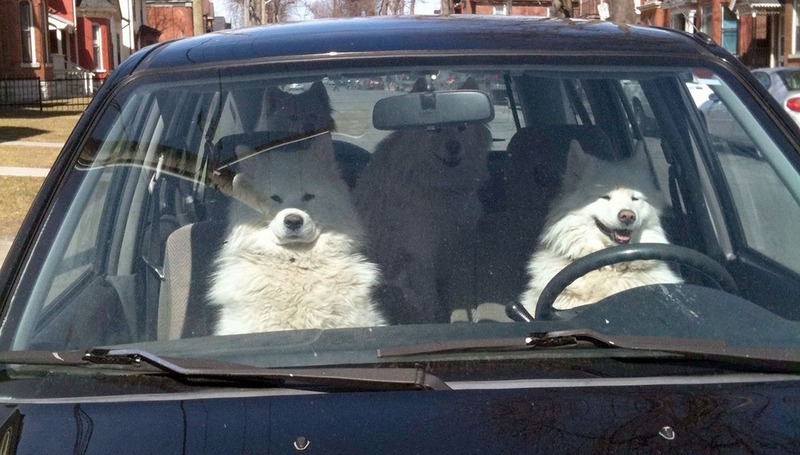 Here’s a picture of dogs driving a car.